I remember when Boucheron introduced Pour Homme Eau de Parfum in the early nineties. It was considered rather decadent, rather gay, to have a man wear something called "perfume". In retrospect such concerns over one simple word are hilarious, but at the time it took some days for me to muster up the courage to go into Saks Fifth Avenue in Beverly Hills to investigate the scent. Thankfully, a kind salesman guided me to the tester. I immediately loved Pour Homme and bought it. You may chuckle at my trepidation, but times were different 15 years ago for men and toiletries. Just before searching out Boucheron Pour Homme, I had been openly laughed at, ridiculed!, by two young female customers at Robinson’s department store when I bought some moisturizer and skin cleanser from the (now discontinued) Lancôme men’s skin care line. Thank goodness for small (and, yes, trifling) improvements in the world since 1991; men now buy skin care products and perfumes without much fuss. Boucheron Pour Homme contains verbena, orange, basil, coriander, bergamot, juniper, ylang-ylang, iris, citrus, rose, sage, geranium, patchouli, sandalwood, vetiver, moss, amber, and benzoin. Though it is well blended, the scent does reveal some distinct notes. It starts off with noticeable orange and bergamot (rich, not light, citrus) and moves quickly to verbena, iris, rose and geranium. The sandalwood, patchouli and amber are expertly combined and are not readily apparent to me as "individuals" — even in the extreme dry-down. The citrus, especially the orange, stays till the sweet end, as does a glimmer of fresh rose. 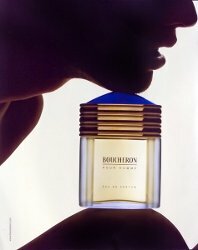 Boucheron Pour Homme is not an avant-garde perfume, but it does not bring to mind any other men’s fragrances I’ve tried. Its interest for me is in the placement of florals at the heart of the scent — florals that will not alienate most men. Many men on perfume discussion boards seem to feel Pour Homme is a scent for an "older" man (defined as "men over 30"…pardon me while I grab my throat and then alter my birth certificate). I started wearing Pour Homme in my 20s and did not feel it was a scent for "mature" men. Pour Homme would certainly be appropriate for formal occasions, a suit and tie (day or night), but it is also light and fresh enough (in cool or warm weather) to wear while walking the dog, at work, or while playing tennis. I can’t think of a place I wouldn't wear it, but for the most part, I'm not one to categorize scents by a wearer’s age, occupation or hobbies. Boucheron Pour Homme Eau de Toilette is readily available at online discounters, as is the Eau de Parfum, a deeper, more opaque scent that still preserves the character of the Eau de Toilette. As of this writing, imaginationpefumery has the Eau de Toilette for $34 for 50 ml; the Eau de Parfum for $48 for 100 ml. Both versions have good lasting power but are not overpowering. Women would have no trouble wearing Pour Homme. I bought this one back in the day from Neiman-Marcus in Beverly Hills and yes, I do remember that it was a little (ahem) out there to be buying “perfume” for men. Your review reminds me of how wonderful this one is: wonderfully rich smelling. I'll have to revisit it. I have tried Pour Homme's feminine counterpart and something in it just made me want to crawl out of my skin. Men's actually sounds like a better scent for me. And I also want to say, what the heck? !, regarding those two girls you mention. If I saw a man buying perfume, moisturizer, cleanser, whatever else for himself at a cosmetic counter, I'd …I don't know, I'd have developed a little crush on him right on the spot. There is nothing more attractive than a man who looks well-groomed and smells great. I used to wear Pour Homme but can't any more because of the memories it produces. It is quite lovely on both sexes but I'm amazed there's no lavender in it – I get a very strong lavender note. Um, I could try that, I guess. But who is ever going to believe a flat-chested, bearded lady? lol! That would be brilliant! Someone should do that.